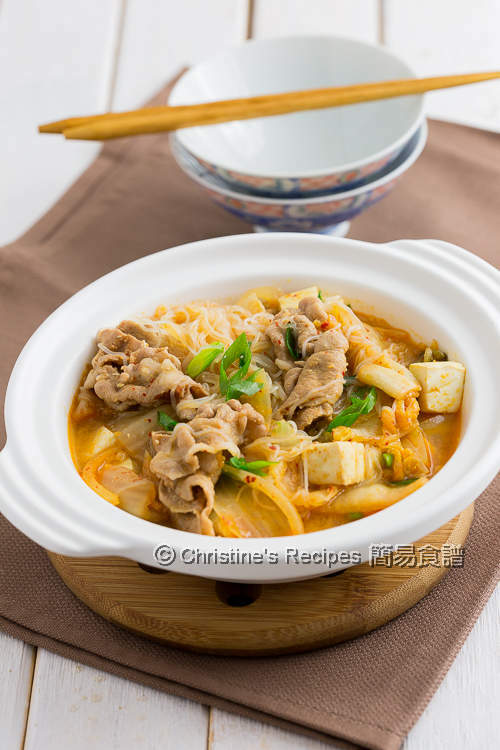 This Kimchi, pork and tofu with vermicelli noodles dish becomes our family's favourite, so nourishing and delicious. You can make it from scratch and serve it on your dining table within minutes. 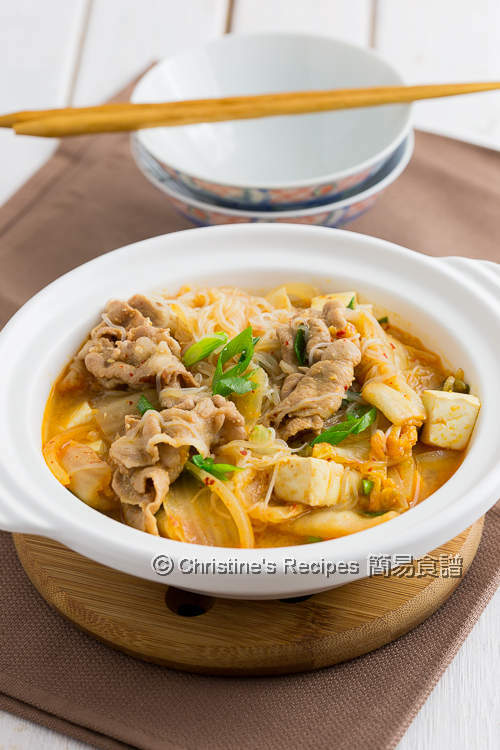 Kimchi is nutritious and delicious that almost can’t be missed in every Korean meal. Miso is also an essential and healthy seasoning in Japanese cooking. I tried combining both of them in one dish, popped in some thinly sliced pork with tofu, and found the end result so amazing. Whenever I don’t feel like standing in my kitchen too long, this one-pot dish will come up in my mind. No matter the weather’s cold or hot, it’s a saver to me throughout the year. 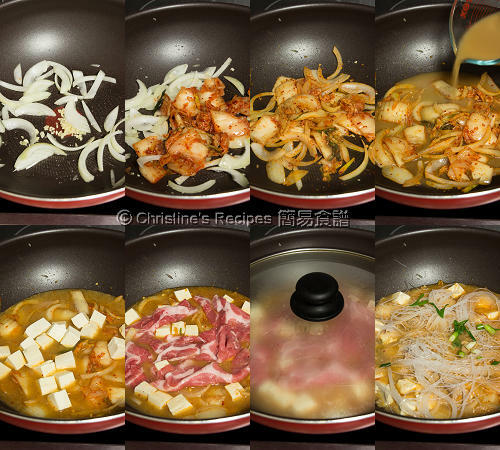 To prepare the sauce: Mix the white miso paste with water thoroughly first. Stir in the light soy sauce and mirin. Set aside. Heat oil in a wok or a hotpot over medium high heat. Saute onion and garlic. Add Kimchi. Pour in the sauce. Add tofu and pork slices and spread them out evenly in the sauce. Cover and cook until the pork is cooked through, about 2 to 3 minutes. As the pork slices are quite thin, it doesn’t take too long. Add vermicelli noodles. When it boils again, it’s done. Garnish with spring onion. Serve immediately. Miso paste is a traditional Japanese seasoning mainly produced by fermenting soybeans, sometimes rice or barley, available at Asian grocers. This time I used salt-reduced, organic white miso paste. If you use any other brand or different type of miso, please adjust the amount accordingly as the saltiness is vary. 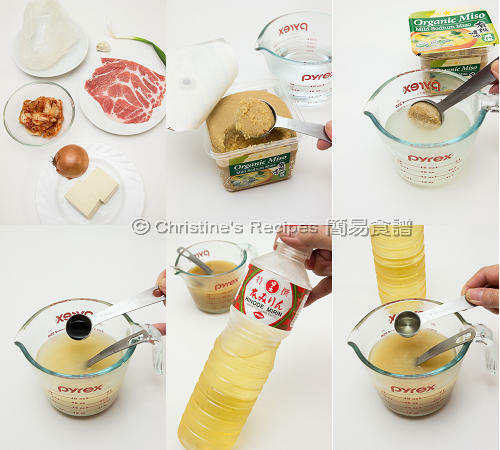 Mirin is also an essential condiment in Japanese cooking, available at Asian grocers. That looks so very appetizing and moreish! Thanks, Angie. It's really delicious. Hi Christine, this looks superb! Especially good during winter days. Thanks for sharing. I did enjoy this dish on a cold day. It tastes as good as it looks as well. Hi Christine, I made this dish for Chinese Nutrition class final and everyone loved it, lots of compliments! Thanks! Good to know that you loved it. Thanks for letting me know. 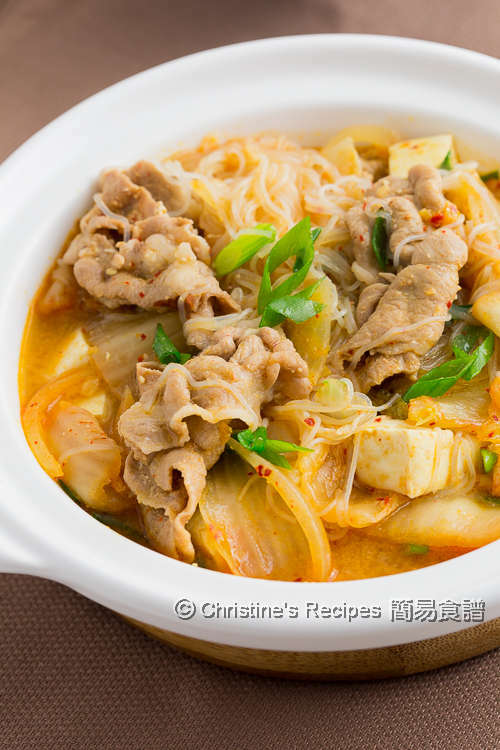 I used Longkou vermicelli (龍口粉絲). Available at Asian grocers. So glad you liked this recipe. Happy cooking!